South Park: Fractured But Whole is a direct sequel of the 2014 game South Park: The Stick of Truth. The game revolves around the player as the New Kid, a day after the events of the original game. While the previous game puts players in a medieval-fantasy role play, SPFBW takes a playful jab in the recent rise of superhero media franchises by heavily using elements of it in the game’s storyline and mechanics. As the New Kid, you’ll literally be in the middle of the “Civil War” between two superhero factions, rivaling each other in creating their own superhero franchises. The game’s simple yet intersting combat system is improved, with the signature “fart” powers still playing a huge tactical advantage both in combat and problem solving. The game will also allow the New Kid to have two different classes, with the freedom to mix and equip different powers for maximum efficiency. Welcome to Supercheat’s unofficial guide of the game. Fans of the series and returning players of the previous game will surely enjoy what SPFBW has to offer. This is a work in progress. 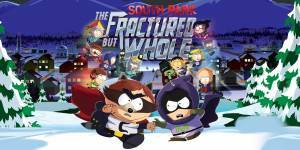 Please also check out our YouTube channel and select the South Park: Fractured But Whole playlist where we upload our videos related to this guide, including the ones not featured in this guide. No discussions open for South Park: The Fractured but Whole at the moment.